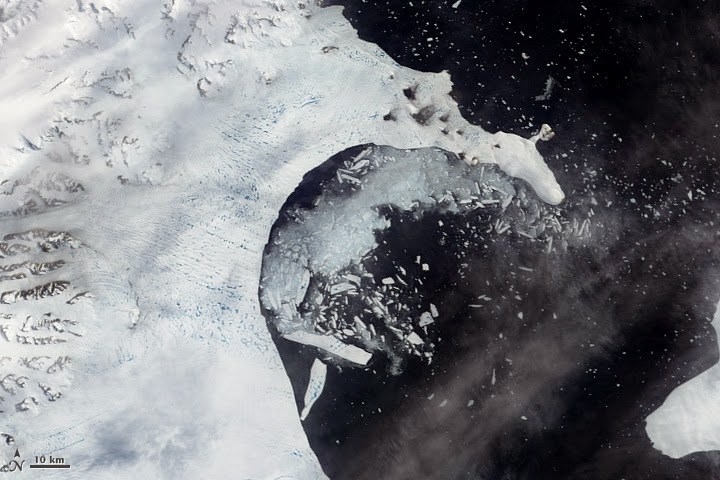 In 2002 the Larsen B Ice Shelf on Antarctica collapsed spectacularly. An area of ice twice the size of Greater London was lost in less than a month. This occurred in the northernmost region of Antarctica - the Peninsula - which has warmed-up by more than five times the global average over the last century. A result of this is that, in certain parts of the Peninsula, the surface of the ice is starting to melt. The water from this melting can accumulate to form lakes up to 4km long. Larsen B was covered in these lakes, but just before the ice shelf collapsed these lakes started to drain. First one drained, then those around it, then those around them in a chain reaction that is suggested to have been key to the sudden collapse of the ice shelf. We don’t know what caused the lakes to drain so suddenly, or exactly how this links to the ice shelf’s collapse. Various hypotheses have been suggested as triggering the collapse; including the forces that the weight of the lakes exert on the ice shelf, and the melting of the ice shelf from below by heating from the ocean. However, it is clear from the sudden drainage of the lakes that their role needs investigation, especially as they are beginning to appear further south on the Antarctic Peninsula.